No image search function by date, type, etc. The Galaxy S6 Edge Plus delivers a lot of photography bang for the buck, and displays its creations beautifully on its huge, sharp display. Read more in our Full Conclusion. The Galaxy S6 Edge Plus is designed to turn heads. Its metal and glass chassis features a large, 5.7-inch dual-edge Super AMOLED display. Rather than have a border encasing all four sides, the long sides are contoured, creating an effect like an infinity pool. The 2560 x 1440 (Quad HD) resolution displays extremely sharp details and vibrant colors, and is extremely bright. This makes it easy to frame your shots, even in very bright sunlight. Sophisticated photography features include a generous number of effects and filters, which you can apply in shooting mode or editing mode after the fact. Also, you can quickly access the camera function by double-tapping the Home button. Of course, you also can drag the camera icon in the corner of the screen, without having to enter your security PIN). The primary camera captures 16M images, while the front-facing (or, "selfie" camera) records 5M images. 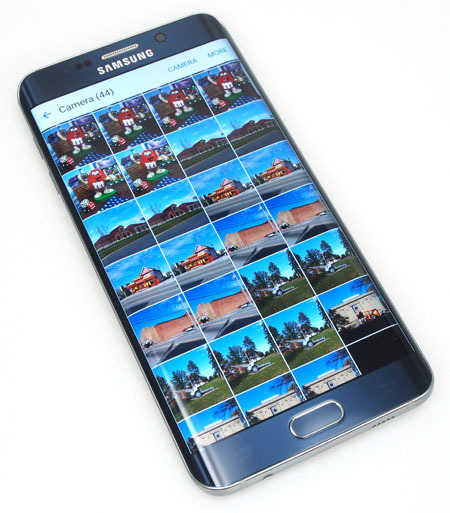 The Galaxy S6 Edge Plus records ultra high-definition video, and like with still images, you can apply many effects and trim your footage easily using the touch screen. Product Dimensions (inches): 6.08" x 2.98" x 0.27"
Samsung's Galaxy S6 Edge Plus comes in 32GB and 64GB versions, and is available in white pearl, gold platinum, and black sapphire. An unactivated device retails for $700, and costs $150 with a two-year contract. Use our best price box at the top right of this page to find online retailers.